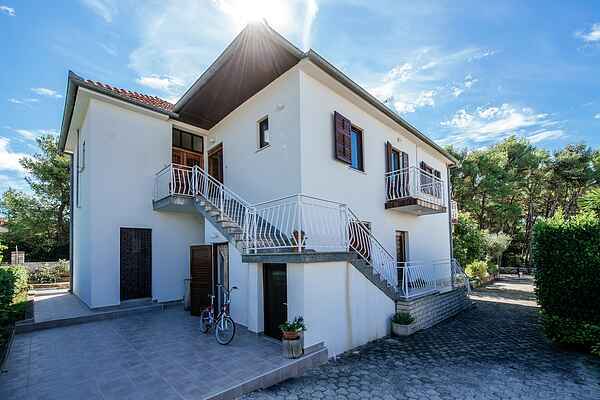 Apartment Jelenka is situated in Pakostane, a charming little village surrounded by the Adriatic Sea on one side and Lake Vrana on the other. Located in a quiet area, this apartment for 5 people offers a possiblility for peaceful vacation. Apartment features a comfortable and bright living/dining area with an open kitchen, 2 bedrooms, a spacious bathroom and a nice, long balcony connecting all three rooms. A spacious patio offers private parking space as well as a play area for the children. You are welcome to use the open kitchen and BBQ facilities in the shared garden in front of the house. Only 200 meters from your apartment there is an extraordinary sand beach suitable for children of all ages. Within the radius of 500m you will find beaches, caffees, a high-quality restaurant as well as a grocery store. In addition to various watersport activities, this region is simply perfect for cycling. There is a 38 km path all around Vrana lake. Rich in biodiversity, the Vrana lake is the top destination for bird watchers and recreational fishermen. Within a 70 km radius there are 3 national parks: Kornati archipelago, Krka waterfalls and Croatia's most important climbing center - Paklenica.